I am in a parochial mood at the moment. I have just been listening to NewsTalk – an Irish news and current affairs radio programme. They were interviewing Architect and environmentalist Duncan Stuart who presents environmental and eco-friendly housing programmes on Irish television. He had agreed to come on to the program to discuss Climate Change and his recent criticism of the Irish media relating to their even handed approach to the topic of climate change. His argument? Manmade climate change “it’s not about opinion it’s not about belief, it’s fact”. Yes his argument is, there is no argument. Just believe what I say and stop being a denier. He made the usual analogies with holocaust deniers and smoking causing cancer deniers. Those were the more cogent parts of his rant. He crashed and burned. I have never heard anyone self-destruct on radio before. It seems Mr. Stuart intended to use the radio broadcast as a launch pad for a run at a European seat in the upcoming elections, on the platform of Global Warming alarmism. Don’t give up the day job Duncan – oh, too late you have. 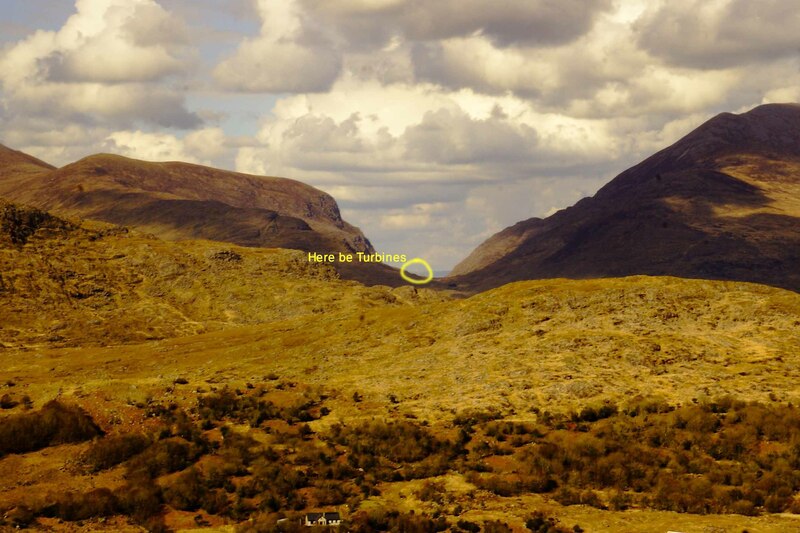 Wind Turbines through the ‘Gap of Dunloe’ – aagghh!! On a recent trip to Kerry in Ireland I happened to stop at a beauty spot on the rim of the ‘Black Valley’. The place is called ‘Moll’s Gap’ the view across the ‘Black Valley’ is stunning, particularly on this rare occasion when there was sun and no rain! It was a walk down memory lane, across the valley I could see the ‘Gap of Dunloe’ where on my honeymoon, 35 years ago, I had travelled on horseback with my new bride (in driving rain and fog). The illusion of a pristine view was shattered when I spied 4 wind turbines through the ‘Gap’, on grabbing my binoculars my heart sank as I saw 3 more. What else is there to say. Clearly there is no view so pristine, no vista so pure that the Irish Government will not allow the wind turbine mafia despoil. The sensationalist press love to make wild predictions and equally wild claims. This year’s forest fire in the US were grist to their mill. Colorado’s June forest fires were billed as ‘largest fires on record’ – ‘will burn until the winter snows’. These doom merchants are all the same, but unfortunately they are rarely taken to task. As mentioned in a previous post, I have a long memory for such events. But having said that who needs a long memory. Summer rains had put the fires out by mid-July. As for them being the largest fires on record, a forest fire in September 1898 burned the entire northwest quadrant of Colorado. The fires this June were only 1% of the area. You would think that the inexorable rise in sea level since the end of the last ice age, approximately 14,000 years ago, would be a relatively simple calculation. Land ice melts; water runs into sea, sea rises, end of story. Nice and simple, that is, if you want to get across a simple message that human caused global warming is resulting in the melting of that ice and the subsequent rise in sea levels. So as a global warming alarmist what you don’t want is nasty facts and complicated variables muddying the water of some ‘settled science’. For instance? Well tidal gauges in the port of Turku (near the gulf of Finland) appear to show that the sea level is falling at 1cm per year (E. Niskanen Isostatic Institution International Association of Geodesy Pub. 6, Helsinki). Stockholm used to be an island, but the sea level here also appears to be falling also at 1cm per year. But even more extreme, the city of Ephesus was a port city in biblical times. Now it is 24km inland and 5 metre above sea level. (Heaven & Earth: Global Warming the Missing Science by Ian Plimer). How can this be possible? We know from high school science that water finds its own level. It can’t be higher in one place and lower in another. But then anyone with a fleeting knowledge of geology would know that this is nothing at all to do with sea level rise or fall but the rise of the land itself. In the case of Scandinavia, the earth is rebounding after the retreat of ice from the last ice age. There are many other possible reasons for these apparently anomalous readings. There could be volcanic uplift, Techtronic uplift. Other things that enter the equation are things like gravity. Large mountains near the sea will create a locally higher level of sea. The coriolis effect will show a higher sea level on one side of a continent than it will on the other due the earth’s spin. My point is that sea level rise is very difficult to measure accurately. In some parts of the world tidal gauges are sinking, registering a false sea level rise. Those that claim a sea level rise over and above the background rise due to the current interglacial (if they are alarmists) will point to the 3mm rise per year over the last 20 years which if extrapolated gives a somewhat alarming trend – how satisfying for them. On the other hand since the end of the last ice age sea level rise has moved in fits and starts as a result of surges of land ice into the sea. You might note that these two competing articles use the same graph. But come one, trying to extrapolate what will happen to sea levels when using a time scale of 20 years and with all the potential inaccuracies and variables. That’s pushing it even for these dyed in the wool warmists. If the sea level rise argument shows nothing else it is that ‘The Science is not Settled’. Drought and Greenhouse Effect – Can’t occupy the same space! Global cooling in historic times has brought on periods of drought. Empirical data from ice cores, lake sediments and seabed mud cores show conclusively that a warmer world is wetter and more fertile while a colder world is dryer, stormier and less beneficial to wildlife. So the wild fires and heat wave in the US are proof (if they are proof of anything) that the earth is not warming. The, so called, Greenhouse Effect (the nature of which I am very sceptical) needs water vapour. Droughts are a lack of water vapour. The warmists can’t have it both ways. More interesting takes on this. There are NO Climate Experts! If you believe everything you read in the blogosphere you would imagine that the scientific community was awash with Climate experts. On a daily basis I hear someone being introduced as a climate expert. But there is no such thing. It is like a Cardiac surgeon claiming to be a human body expert. Just because he has expertise in one aspect of the human body, in this case – the heart, this does not give him the right to claim expert knowledge of the entire human organism. And indeed no surgeon would make such an outrageous claim. So why do we allow these scienticians to get away with claiming to be experts in the equally complex area of the climate. To run with the human body analogy a little longer we might perhaps compare a meteorologist with a GP (General Practitioner) but having said that who in their right mind would allow a GP to treat them if they got their diagnosis (or forecast) as wrong as the average weather man/woman (for the Brits – who can forget Michael Fish). The climate and its influences are many and varied and in numerous ways are far less understood than the workings of the human body. So often I read claim and counter claim between warmists and sceptics about whose scientific qualifications are superior to who’s when debating a particular point about Global Warming. This is Aristotle’s number one logical fallacy, similar to the child’s playground retort of ‘My dad’s bigger than yours’ but because we are adults we call it the appeal-to-authority fallacy. I think the most glaring example of this was Dr. Rajendra Pachauri’s dismissal of Indian Glaciologists when he accused them of using Voodoo science because they dared to question his sacred IPCC’s peer reviewed data on Himalayan glacial melting. The subsequent investigation exonerated the Indian scientists extracted an apology from Pachauri and exposed the fact that a lot of information used by the IPCC that should have been peer reviewed (including the Himalayan Glacial melt claim) was not. If the head of the IPCC can be such a jerk when it comes to an appeal-to-authority on climate then I doubt there is anyone else who could claim to have a greater breadth of knowledge of climate that would single them out for the title of ‘Climate Expert’.